Martin’s symptoms have not alleviated much since my August 26 confession. They improved while we were on vacation in the middle of nowhere, but since our return to New York City, it’s more of the same. He’s still engaging in self-stimming, repetitive behaviors, mostly skipping, as from the sofa to the dining room and back, and to, and back. His attention span, unless he’s watching a video—preferably Sesame Street, and most preferably an episode he’s seen enough to memorize—is 4.6902 seconds, give or take. He seldom responds to his name until I’ve said it politely four times, then barked it, twice, while jumping in the air and waving my arms. There is some piece to the Martin puzzle that we are missing right now, some key that we haven’t found. Have I given up hope? No. Not by a long shot. Adrian and I will recover our son. And when we have recovered Martin, I will look back on this time—summer 2012, beginning of fall, and not too much more, I hope—as the dark, difficult days. Throughout these dark days, I’m searching, and not only for the solution to Martin’s puzzle. I’m searching for a more peaceful approach: a way to explore every avenue to recovery, without also fretting that most avenues are too cluttered to lead anywhere. The pivotal moments we seek in life to change us and those around us are always laid on top of another quieter, grander story that has been unfolding on our behalf since the very beginning. Martin’s recovery is happening. Even when we are plagued with symptoms, like now, Martin’s physical health is sound, he verbalizes new observations, and he’s happy. He’s a happy boy. My job is to continue struggling for his recovery with the comfortable resolution that, however long the path, the direction is right. My right arm (see picture, below) is speckled. From the base of my thumb to the crook of my elbow extends a splatter of burns. They’re superficial, for the most part, and healing, though some still open painfully if rubbed. I had a vegan-cooks-meat accident. The tongs were in the dishwasher, so I decided, in my inexperience, to flip a duck breast with a spatula into the crackling, liquid fat, which, it turns out, splashes. Adrian, an American-history buff, is forever prattling about George Washington’s failures as a general before he led the Colonies to independence, and about the number of elections Abraham Lincoln lost before the victory that counted. I can lose many battles and still win this war. 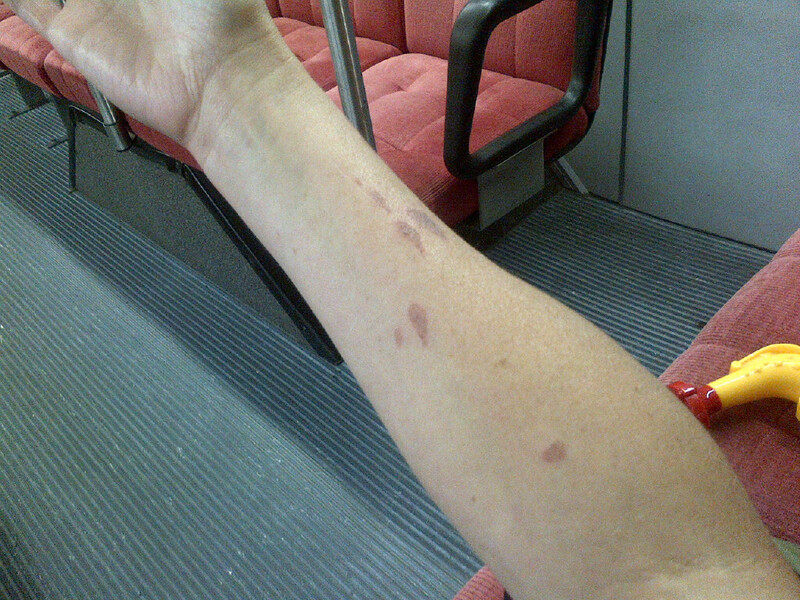 My battle-scarred arm, photographed spontaneously on a bus.